WOW! I really like him. His hands are so expressive. He looks awesome! I love his feet and hands! I can't wait to see all fired and assembled! Tomorrow I will start something that saddens me^^" Sanding in water. He looks really good! It's nice to see him coming together. Very nice- you have a definite definable style. I'd love to see your two dolls together. I second that! Good luck with your sad sanding. He looks great!I looking forward already him with face up! I was just reading an article about how animators have an easier time drawing their own gender. 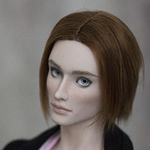 Did you find sculpting this male doll easier or harder than the female doll? 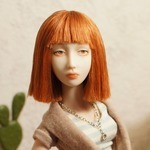 I wonder if that is why we see more female porcelain BJD's then male? He is very handsome. Love him. Very handsome, I love him blonde...reminds me of all the elves in 'Lord of the Rings'.